Welcome to our first newsletter promoting dining in the Warburton Valley. This edition will come out 1-2 times per month, in addition to our regular 'What's on in Warburton' updates. There are two current dining specials in Warburton at present. Special this week on Thursday 9th and again Thursday 23rd - 12 Items buffet just $14.90 per person. 6.30pm - 8.30pm. Drinks half price - Don't miss out! Ph 03 5966 9182 or 0433 962 002 for bookings. Seniors' Monday - Every Monday - 20% off food and drink upon presentation of your seniors card. (Valid per person per cardholder) Ph 03 5966 2400 for bookings. The Patchwork Teahouse - An award winning Patchwork shop in the unique setting of a popular tearoom. 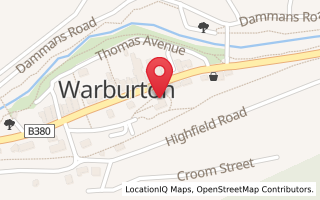 Situated in a delightful 1930s building at the entrance to Warburton. Our aim is to make your visit a memorable one. Tea rooms seating 40 people. A place you will want to return to many times. Open 6 days 9.30am - 5pm - closed Tuesdays. And for those of you who might have forgotten....it's Mother's Day this Sunday. I've made my booking for lunch - have you? If you are bringing your wife or Mum or Grandma or Nana or Baba out for a Sunday drive this Mother's Day - and are thinking of eating out - suggest contact one of our local cafes to make sure you get a seat.